Check out the race results and some very cool photos from the fifth & final stop of the 2013 Swell Beach Race Series in France, where Arthur Daniel claimed another race victory as well as the overall Series crown. Runner-up was Yoann Cornelis followed very closely by Martin Letourneur, while Solange Pruvost won the women’s race. I raced against Arthur, Yoann and Martin this year and can tell you from first hand experience that France is full of talent. These guys are fast and a lot of them still have years of paddling in front of them (three of the top four on the weekend were juniors). So while Frenchman Eric Terrien has been flying the flag for Europe the past few years, keep your eye on several of his compatriots to make a big move up in the SUP world over the next year or two. Scroll down past the pics for the full race results. Recap thanks to event organiser Greg Closier and photos by Loic Olivier courtesy of Swell Addiction (more pics on Facebook). On Sunday 25th August we held the fifth & final event of the 2013 Swell Beach Race Series at Penfoul Beach, on the West coast of France, with 3ft surf offering plenty of action! There was a strong battle between Arthur Daniel, Yoann Cornelis and Martin Letouneur. Ben Carpentier, who is more well known for his SUP surfing skills, also showed how fast he can go. But in the end it was Arthur who was on fire and claimed the double victory, both for this race as well as the overall Swell Beach Race Series title (based on the 4 best results). Meanwhile Solange Pruvost scored the victory in the women’s division (both today and overall). The Top 10 from the overall Series ratings were in the running for a plane ticket to California (presumably for the Battle of the Paddle) thanks to the main sponsor Swell Addiction. Quite fittingly it was Arthur who’s name was randomly drawn and so the young gun gets a free ride to the USA! 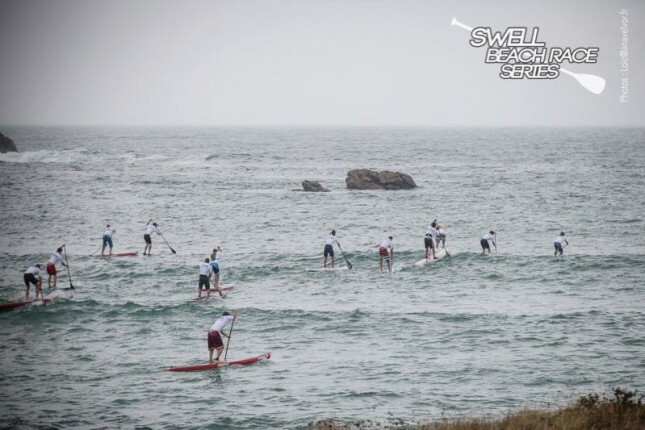 After the event a nice & tasy organic meal was served up to the paddlers to finish the day and the Swell Beach Series for another year. Big thanks to our sponsors: Hobie SUP, Howzit, Ion, Fanatic, Swell Addiction surf shop and La vie Claire organic food.